Let’s take a Selfie Pulla song sung by Vijay is trending over iTunes and other social networking sites. Vijay has sung the song for which Anirudh has composed the music. The song has topped the iTunes list. 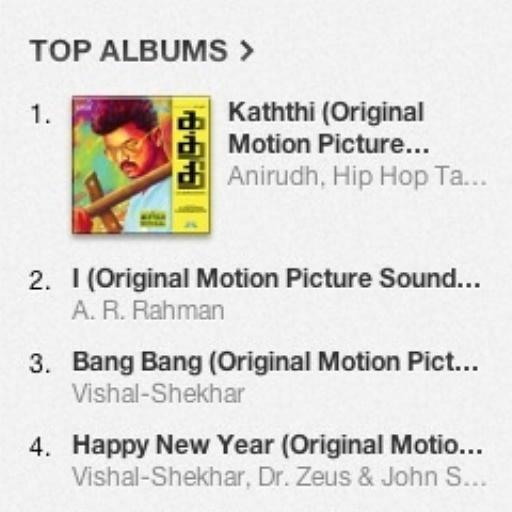 "Kaththi" songs are available on iTunes and one can buy the songs, HERE. Directed by A.R.Murugadoss, "Kaththi" is touted to be an action thriller. The film will have Vijay appearing in dual roles, while Bollywood actor Neil Nithin Mukesh plays the baddie. Samantha, comedian Sathish and Tota Roy are also part of the film's cast. "Kaththi" shooting is nearing completion and is expected to be wrapped up soon. The film will be releasing as a Diwali treat for fans. It will be Vijay's second film with Murugadoss after blockbuster flick "Thuppakki." The action entertainer reportedly earned more than ₹100 crore at the box office. Whether "Kaththi" will be able to repeat the success of "Thuppakki" is something one will need to wait and watch.